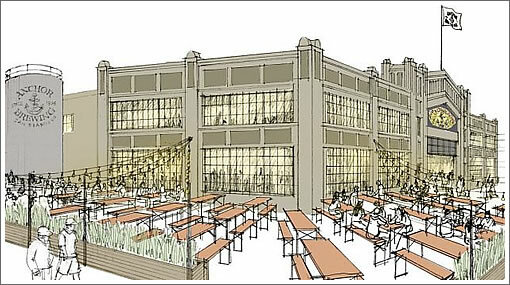 The San Francisco Giants have signed Anchor Brewing to renovate San Francisco’s Pier 48 and build new brewing, shipping, drinking, eating and educational facilities on the site, a true anchor tenant for the Giants’ massive Mission Rock Development. 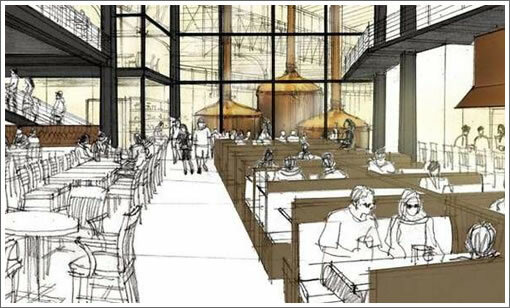 The new Anchor facility will feature production facilities for brewing, distilling, packaging, storing, and shipping; a restaurant, museum and educational facility in the headhouse of Pier 48; and a restored walkway around the entire pier apron that will connect pedestrians to the Portwalk and allow views into the Anchor brewhouse. Anchor will offer tours of the facilities and educational seminars with a focus on the history of craft beer, the art of craft distilling and Anchor’s history in San Francisco. While the 27-acre Mission Rock development will likely take a decade to finish, Anchor could be up and brewing on Pier 48 by the end of 2016, quadrupling current production from 180,000 to 680,000 barrels a year. On a related note, how many Anchors do you have to drink to do math like “quadrupling their production from 120,000 to 600,000 barrels a year”? As a big fan of German Biergartens, I love the outdoor tables. Very good news. 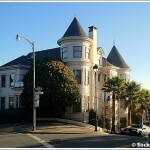 Does this mean that Anchor will move out of their De Haro St. facility? Interesting to see that the new owners of Anchor taking the enterprise towards much more mainstream operations. Actually, turns out that the original report of Anchor’s expansion quadrupling their annual production capacity was (approximately) correct all along. 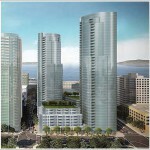 Either way, great news for SF’s waterfront and great news for beer lovers. So you could say this is the project’s Anchor tenant! Appreciate the corrected numbers. It’s encouraging that the new owners of Anchor see a potential need for quadrupled capacity. Anchor is really good beer and it deserves success in new markets. And for those of us who already drink Anchor, the new Biergarten and restaurant/brewpub/whatever will be a great addition to the city. I don’t much care for anchor. Lots of great local beer makers, anchor doesn’t crack my top 5.
sparky*b, since you’re aware of the great local beer scene, you’re probably aware of the fact that Anchor is a member of the SF Brewer’s Guild, along with some of those great local breweries. Each quarter, the Guild has a “Meet the Brewer’s night” where its open to the public to meet brewers from those breweries. With Anchor’s proposal, I can see those Guild meetings hosted by Anchor shifting to this new location, drawing in more people (currently, its a kludge to get into MtB at Anchor on Mariposa) and exposing them to the locally-brewed alternatives to Anchor. I think this is a win all around, but I do understand where you’re coming from. But seriously Anchor has kind of slept through the last two decades of microbrew evolution. They purposely resisted the urge to jump on every lemon-in-your-weissbier, Belgian oddity, and dump two bales of hops into your Double Imperial Pale Ale trend that has come along. They had been purists sticking to their flagship products. That seems to be changing now that Fritz Maytag sold off his interest in the brewery. Expect more changes to come down the line. I just hope that advertising and distributing farther than the beer can survive aren’t among the changes. Anchor is revered in craft brew culture due to the fact that they saved one of the few non light lagers left in the USA post-prohibition. Maytag and Co. were the spark that ignited the microbrew scene in the 1980s. Belgians and hopy IPAs, love them both. I am not negative about them at all. yummy. Obviously there are more interesting beers out there, as anyone partaking in SF Beer Week could plainly see… and taste. But we can’t always be drinking the 11% ABV 750ml $15 imperial stout with the unpronounceable Belgian or Danish name, much as we’d like to. Or Pliny the Elder, for that matter. I know Anchor is all about craft brewing but I think of it as the mass-market substitute – it’s the best regular-strength beer that’s good with a casual meal or as a post-workout thirst quencher and is available everywhere (in SF that is) in a six-pack for under a fortune. It beats Sierra Nevada, it beats the standard Safeway-stocked imports (Heineken, Dos Equis, Urquell, etc.) and it most certainly beats all the mass-market American crap you might see TV commercials for. I buy Trumer on occasion but most of the time when I’m not going for the special stuff, it’s Anchor for me. Its refreshing when something tasteful happens. The Heath building, this… others. So how in hell is it that the bozo’s at planning don’t wake up to the idea of aesthetics? Too much of what is done here might as well be anywhere, but all planning seems to do is fuss over the wrong stuff. Perplexing. If it’s OK with you I don’t want government to be in charge of aesthetics. Zoning, enforcement, clearinghouse for complaints, yes. Decider of what’s good and bad taste, no thanks. Speaking of beer week and unpronounceable imperial stout, 101 north’s Naughty Aud is great. Lagunitas or speakeasy at most places and those are winners. cool biergarten location. I will drink anchor here when it opens. Thrilled about this development. Lave it to the Giants to do it right. Warriors ownership should take a lesson.